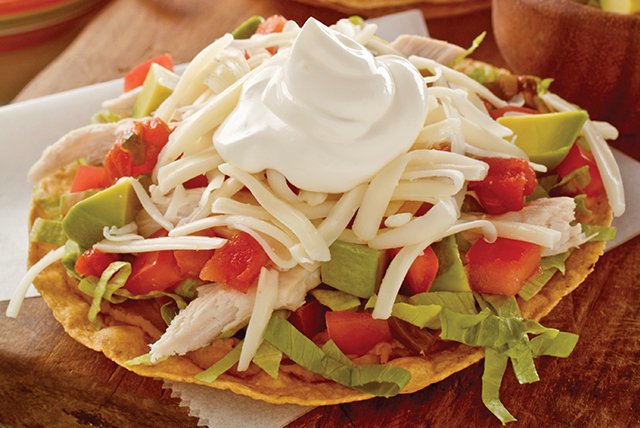 Find out how to make tasty tostadas at home with this Mexican Chicken Tostadas recipe. Fill crunchy shells with chicken, veggies, cheese and sour cream when you make these easy Mexican Chicken Tostadas. Serve with a mixed green salad tossed with KRAFT Lite Ranch Dressing. Prepare as directed, substituting shredded cooked beef or browned ground beef for the shredded cooked chicken. Pico de gallo is a relish or condiment of finely chopped ingredients, such as tomatoes, onions and peppers, mixed with a variety of seasonings. Use in recipes instead of your favorite salsa.